Private Sector Debt is the Problem. Much Higher Government Deficits are the Solution. Except in the Eurozone where Euro is the problem and no Euro the solution. 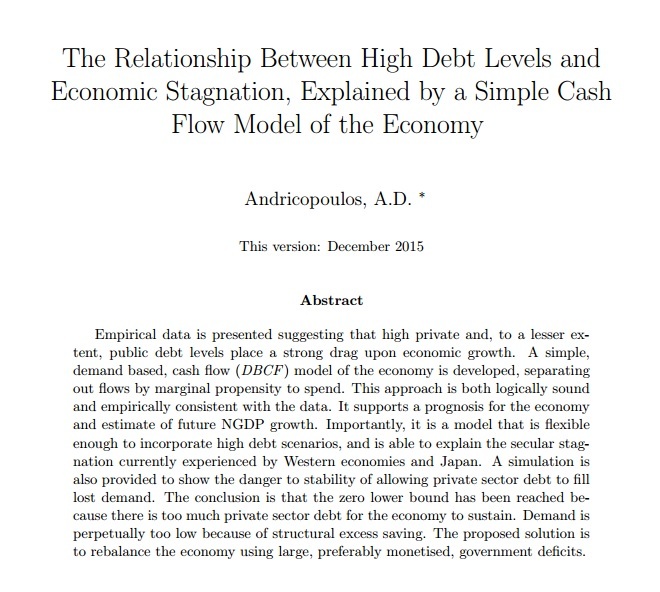 In previous posts, I have described a Stocks and Flows model which attempts to model the interaction between workers and savers in an economy. I have built a very simple version of this model in order to simulate economic outcomes. As I make clear in a previous post, I don't believe that non-linear models such as this can be used to make measurable predictions (eg. what will GDP be next year). However, as Steve Keen has showed, these models are very good for getting an idea of economic dynamics. The economy does not grow (this can be adjusted by putting an investment coefficient in to the model and assuming returns on investment). The coefficients of spending all stay constant. There is no change in a recession/boom. In this simulation, potential GDP (that is GDP at full employment) is 1. The economy can adjust to a lower GDP through deflation so, at an equilibrium lower than 1 we can still have full employment. The adjustment would presumably be painful though. 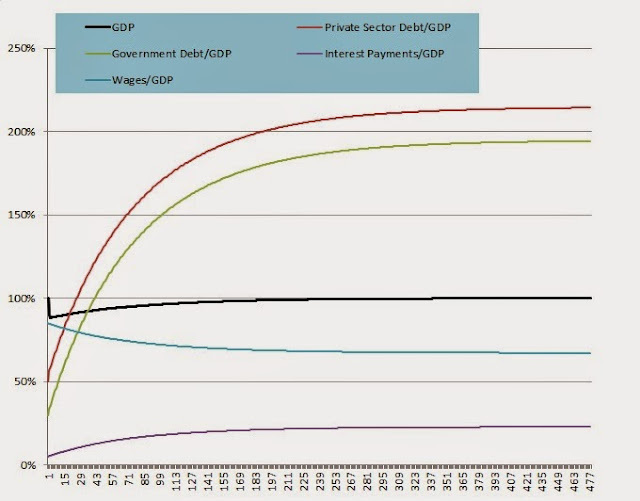 The equilibrium is the point at which GDP stays unchanged and debt does not increase or decrease - in other words, the saving for the future exactly matches the spending of existing debt. My simulations here are of an economy where the savings rate is too high. In other words people are spending less income than they are receiving. 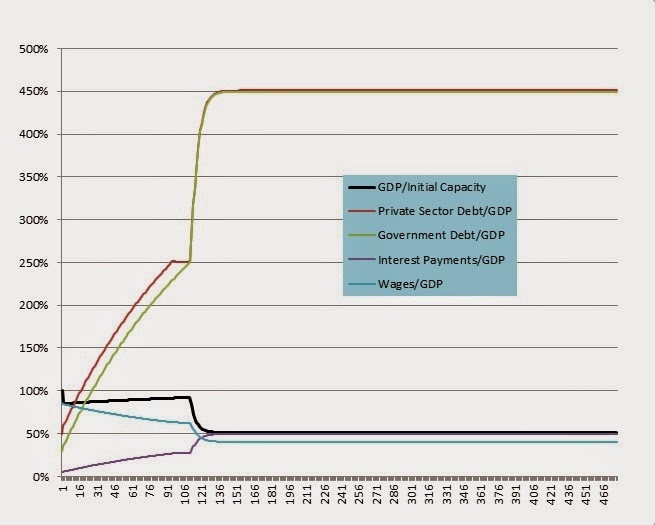 In order to stop the economy declining, the government here increases private sector debt and government debt. This is similar to what has happened in the Western economies over the past 40 years. Because each year the debt has gone up, so too do the interest payments. Because the marginal propensity to spend of the receivers of interest payments (eg pension funds) is much lower than that of the payers (the workers) this increases savings further. In the end an equilibrium is reached where the total new savings from income are matched by the amount of existing savings spent. If the debt is very large, then the workers' share of income will be lower, but the pensioners' spending will make up for the workers' low consumption. However, in order to be consistent with reality, I am putting in a limit on the total amounts of government and private sector debt. At this level, I assume that no more money will be lent. I have set these as both 250% of GDP. At this point the credit line stops but existing debts must still be serviced. The total debt levels off at around 400% of GDP. At this point the spending of existing debt exactly matches the savings from income. The economy is running at full capacity. However, this benign scenario assumes that the equilibrium level can be reached before we hit the debt limit. What if we hit the debt limit before the equilibrium level is reached? This scenario is not so great. As the 'debt ceiling' is hit and the savings rate is still too high, GDP starts to decline. This makes paying back the debt harder and so the next month GDP declines further. This continues until a new equilibrium is reached here at 50% of capacity. In this scenario, public and government debt levels to GDP rise as GDP collapses. Interest payments as a proportion of GDP rise and the workers share of GDP collapses. Eventually the economy finds a new equilibrium, but it is one in which the workers are effectively slaves of the savers and it is one where deflation, unemployment and depression will continue for a long time until the new equilibrium can be found. And note that this contains no extra saving during a depression or overconfidence in a boom which many models suggest will also occur. This is just the result of the dynamic between savers and borrowers. Is this scenario ridiculous? In an economy where no new money can be printed (see the Eurozone), where debts can not be defaulted upon and where no new money will be lent, it is actually difficult to see another scenario. Greece's trajectory in fact, has not been too different from this. So the question for us is, have we hit the equilibrium yet or are we still net savers? 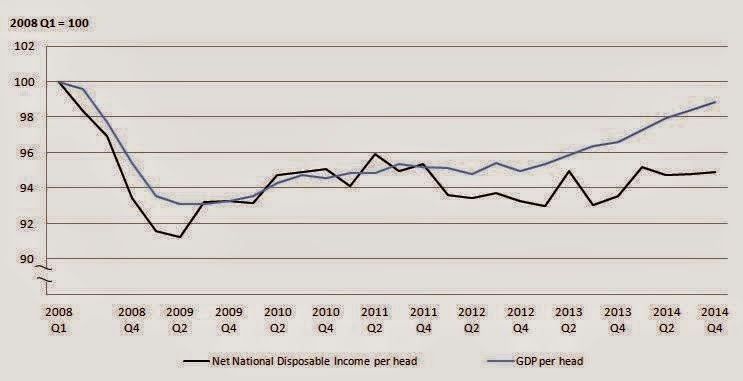 Taking the UK as an example, Simon Wren Lewis presents the following graph of net national disposable income per head since 2008. This suggests that there is a natural shortfall of demand in the economy that requires further borrowing to fill. 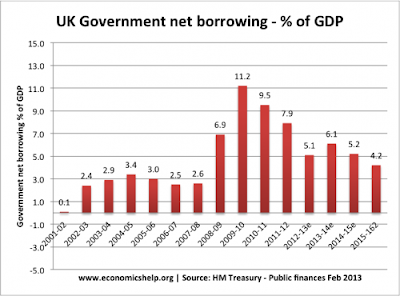 On top of this, we have had zero interest rates and programmes such as Help to Buy which have encouraged private sector debt and raised asset prices. If the economy requires all of this help to stay flat, I fear that our problems are of the deeper kind, and that we are closer to scenario 2 than scenario 1. Sorry, I have had to moderate comments because of an annoying pest spammer who keeps posting American football matches links. The government must run deficits, even in good times. Why Shares are too Expensive. And, while we're at it, is the idea that shares always out-perform partly just a historical anomaly? How high debt has caused our economic stagnation. I apply modelling skills learned in 15 years in the financial markets to look at the economy. Ari Andricopoulos. Simple theme. Powered by Blogger.